Even as 2007 turned to 2008, an incident occurred at village Khorashkhuli, at the edge of the Chandra forest range in West Bengal's West Midnapore district. Villagers here, mostly Lodha tribals, chopped down about 6,600 young eucalyptus trees on a six-hectare state forest department plantation, claiming the land was theirs and they wanted it back. "Our forefathers cleared and levelled the land and grew crops," said Subhadra Naik, whose husband, Bansi Naik, led the tree-felling. In 2001, forest officials had asked for land along the fringes of the village fields; in 2004, the eucalyptus plantation started as a joint forest management scheme funded by the Union Ministry of Environment and Forests. Under the scheme, every family in the village would receive 25 per cent of the cash earned from selling the trees after harvests 10 years later, in 2014. But villagers couldn't afford to wait that long. "Eucalyptus doesn't give us food.For several years my family hasn't been able to eat properly," said Helu Doloi, a resident. The Lodha said they were reclaiming the land under the Scheduled Tribes and Other Traditional Forest Dwellers (Recognition of Forest Rights) Act, 2006. At the time of the reclamation, the act wasn't notified. But that didn't faze them. The forest department said it would file charges. "There are two extreme positions on the act. One holds that historical injustice has been done to forest dwellers, while the other believes the last forest tracts will be handed over to people who cannot coexist with wildlife, especially tigers. The biggest challenge is the determination of "critical wildlife habitat". The rules ignore how this aspect of the act will be secured. Many say the gram sabhas cannot be given this important task. Why are we reluctant to rely on the wisdom of ordinary gram sabha? Who conserves forests? Aren't the daily wagers in forestry, the guides, informers, knowledge holders, the village boy who shows tigers to urban enthusiasts, members of the same forest dwelling communities? This act is about their security of tenure." The act, let us call it fra, was notified a few days later. Literally, a tectonic shift occurred. Of what kind? Here's Madhu Sarin, commenting on this incident "Till date forest departments have got away with declaring diverse lands as forests without following the law and labelling those occupying the land as encroachers. The forest rights act will enable the people to reclaim their rights. It helps them challenge unfair expropriation. Forest departments will no longer have the rights to use the law for appropriating lands as 'state forest'." 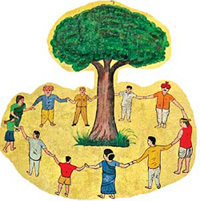 With renewed confidence, then, on August 1, 2008, people of the forest village of Mendha Lekha, in Gadhchiroli district of Maharashtra, applied for the right to oversee 18 sq km of village forest area. They had already had nistar rights over 2 sq km of forest. Now they wanted more. Were they greedy? The forest area they wanted was under the stewardship of the forest department. The department, till villagers applied for control of the forest, had not shared profits from the sale of tendu leaves and bamboo. "In the absence of a rights regime previously, a lot of these resources were harvested unsustainably by contractors under licence from the forest department," contended village head Devaji Tofa, defending the application. "Given our dependence on the forest for leaves, grazing, fruits, firewood and medicinal herbs, rights over 2 sq km of forest were not enough to sustain the village." All over India, the process of implementing fra is affected by the fact that those who wish to claim rights have been given just three months to do so. That's how the government works make a good law, and then create a procedure that ensures the law becomes a paper tiger. Mendha was right there. It set up a forest rights committee on May 1, 2008 three months to go. It applied to the revenue department for certified copies of land records. It applied to the survey department for certified copies of the survey settlement records. It applied to the forest department for compartment numbers, maps, information on mfp extraction for the last 10 years (type, quantity and prices). It completed the application procedure on time. fra, predicated on correcting historical injustice, actually rearranges entitlement to resources for all time to come. The government took two years to notify the act. But the news was already out. Mendha knew what to do. Everybody knows.